Military action movies have been a prime staple within the action film genre. Exploring various branches of the military (army, navy, air force, SEALS, etc. ), these movies are primarily focused (much like the genre itself) on action premise, relying on tried and true aesthetics of military action / violence to showcase the film’s narrative. While some are a bit nonsensical (i.e. going with the flow of the film’s premise), stories of war, secret missions, occupation, and tension between nations are these movies “bread and buttered”, making the effort to show the grizzled action (on all forms of the military branches) as well the espionage side of opposing government / nations on matters of military strength (i.e. to defend, to invade, or to hold their ground) against warring enemies or rival team members. Additionally, military action features have also weaved into other genres (drama and sci-fi) in order to expand upon its storytelling. Some of the best and recognizable military action movies includes 1978’s Apocalypse Now, 1986’s Top Gun, 1987’s Full Metal Jacket, 1995’s Crimson Tide, 1998’s Saving Private Ryan, 2002’s Black Hawk Down, 2002’s The Sum of All Fears, 2017’s 13 Hours: The Secret Soldiers of Benghazi, and 2018’s 12 Strong. Now, Summit Entertainment (along with Original Film and Millennium Entertainment) and director Donovan Marsh present the latest military action thriller endeavor with the film Hunter Killer. Does the movie swim gracefully or does it sink laboriously fast? On a patrolling mission near Russian waters, the USS Tampa Bay (a “Hunter-Killer” submarine) is lured into a trap after it picks up on a strange situation involving an explosion on an enemy sub. 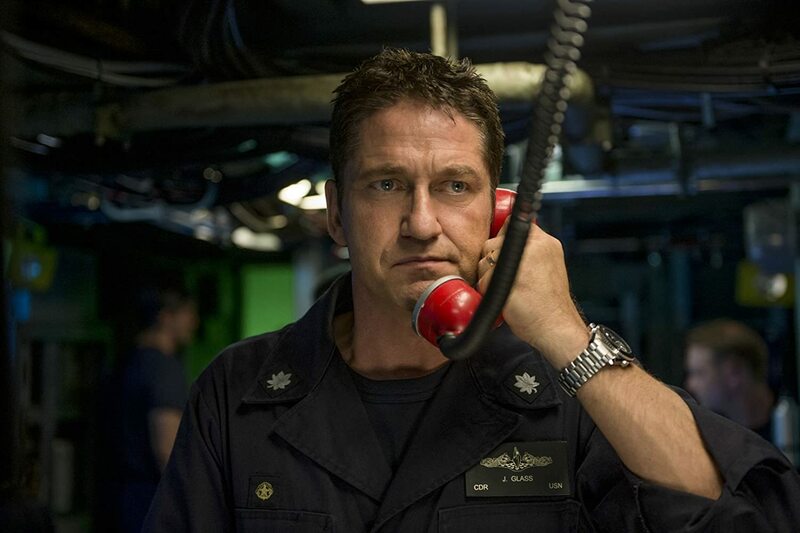 Sent to investigate the destruction of the Tampa Bay is Commander Joe Glass (Gerard Butler) is sent to command the hunter killer submarine USS Arkansas, venturing into dangerous waters to determine what happened and who to hold responsible, while taking some questionable decision that puts his crew at risk. At the Pentagon, Admiral Charles Donnegan (Gary Oldman) is trying to see through the chaos, concerned that the action in the ocean is taking America closer to World War III. Monitoring the situation are Rear Admiral John Fisk (Common) and NSA analyst Jayne Norquist (Linda Cardellini), who put their faith in the what the crew Arkansas finds as well as in a small Navy SEAL team, led by Lieutenant Bill Beaman (Toby Stephens), who are ordered to slip into Russian territory and figure out what’s happening to President Zarkarin (Alexander DIachenko), who’s at the mercy of rogue agents looking to stage a coup d’état, spearheaded by Russian Defense Minister Dmitri Durov (Mikhail Gorevoy). Growing up in the 90s, I remember seeing plenty (and I do mean plenty) of action movies, with most being released during the mid to late 90s. Perhaps one of the earliest ones that I could remember watching were Top Gun and Under Siege. While the latter was lesser known than the former, both movies were sort of might introduction to dramatized military movies, especially those within the action genre. From there, I saw loads of action movies (ranging from great to mediocre ones) that encompass several different military branches as well as genres, including the more sci-fi ones (Stargate and Starship Troopers), the espionage ones (The Sum of All Fears and Jason Bourne), the more historical war ones (War Horse or Saving Private Ryan) and more modern-day war themed movies (Act of Valor and 13 Hours: The Secret Solders of Benghazi) and many others. Altogether, while some may be better than others (in both movie critics and moviegoers’ eyes), military action are fundamentally essential within the action genre and warranted from Hollywood continuous cycle of chronicling militaristic action heroics (and tragedies) onto the silver screen. This brings me back to talking about Hunter Killer, the latest endeavor from Hollywood that delves into the military action for theatrical entertainment. For those who don’t know, Hunter Killer is based off the 2012 fiction novel titled “Firing Point” by Greg Wallace and Don Keith. Working at a bookstore, I do remember seeing (and shelving) that book from time to time, but I never picked it up and the read the novel. Thus, my review for Hunter Killer is gonna be strictly based solely on the film and not so much on what was added, removed, or changed from page to screen. Anyways, I really didn’t hear much “internet buzz” about this movie, but I have seeing the film’s various movie trailers quite frequently when I go to my local movie theater. Basically, they played the film’s trailer almost every time I went to go see a PG-13 movie. While I did forget to post the trailer on my blog (sorry…my bad), I have to say that I was slightly excited to see this movie. Like I said, I do like action movies (especially some military based ones) and the movie’s premise / plot looked right up my alley for movie escapism. Plus, I did like the movie’s cast (i.e. Butler, Oldman, Common, etc.). So, I went to see the movie, hoping that Hunter Killer would appease my “action appetite”. Did it? Well, sort of yeah. 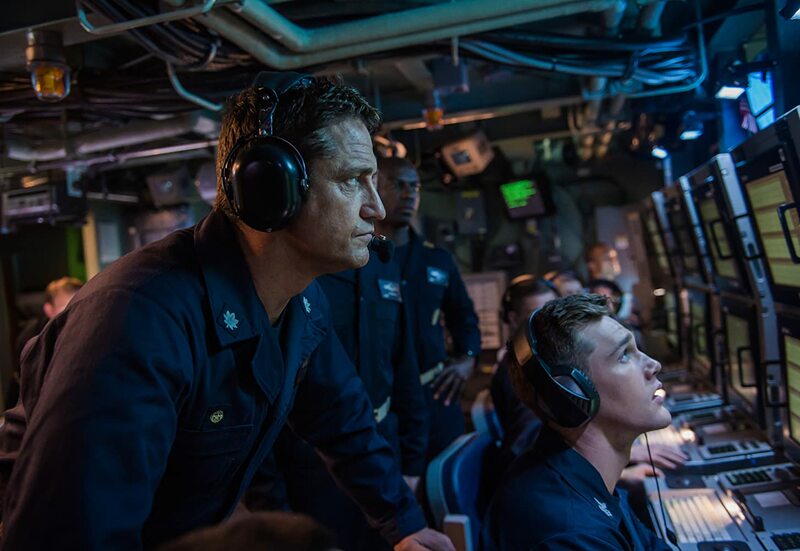 While there are some problems that movie can’t shake, Hunter Killer succeeds in being a fun (if maybe mindless) popcorn-ish military action motion picture. It may not beat out the classic 1990 film The Hunt for the Red October, but the movie does have some guilty pleasure 90s action vibes that help elevate the feature. Hunter Killer is directed Donovan Marsh, whose previous directorial works include the TV movie The Good Fight as well as the feature films Spud and Avenged. While most of his prior works are considered “smaller” endeavors, Marsh makes Hunter Killer his most ambitious (and largest) directorial projects to date, including a expansive story and several big named actors attached to film. To his credit, Marsh does manage to create an effective and cohesively feature film, making Hunter Killer work for the most of its sum parts. While the movie might not be the most creatively / original piece, Marsh seems to make the film relish in its storytelling, producing a feature film that, while cliched at times, gets more right than wrong and succeeds in being a militaristic action thriller. 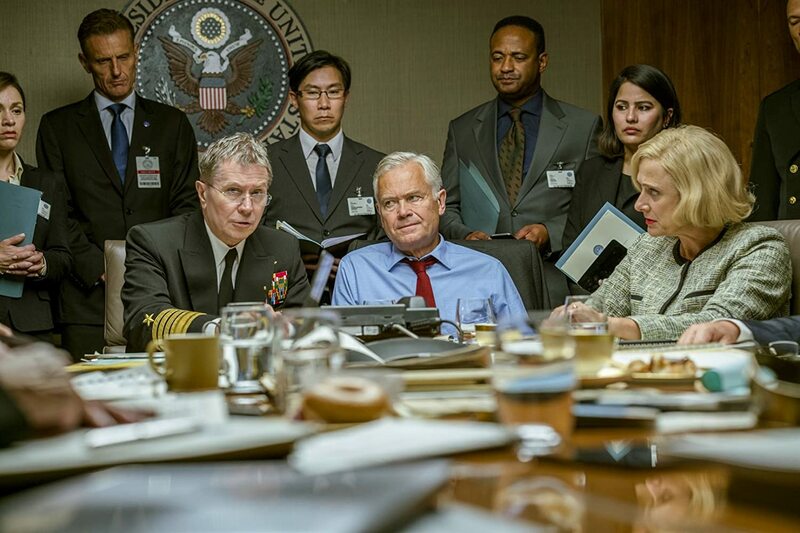 Given the nature of the movie’s story, Marsh has three distinct narrative threads to follow and weaves them together to create an interconnected plot that goes from under the seas, behind enemy lines, and into war room of the CIA. To that effective, Marsh succeeds, making Hunter Killer’s framework picturing a classic 90s action film that interconnects story threads into an entertaining piece of engaging cinematic action heroics and large-than-life heroism. Thus, Marsh also seems to know that the movie isn’t exactly true to form realism (something akin to Crimson Tide or The Hunt for Red October), but he also doesn’t make the movie hokey or stupid like cheesy B-rated throwback movie. To be honest, he finds a sort of “happy medium” in-between those two extremes points, finding Hunter Killer stands on its own merits (and ground) for a mostly engaging and thrilling action flick. 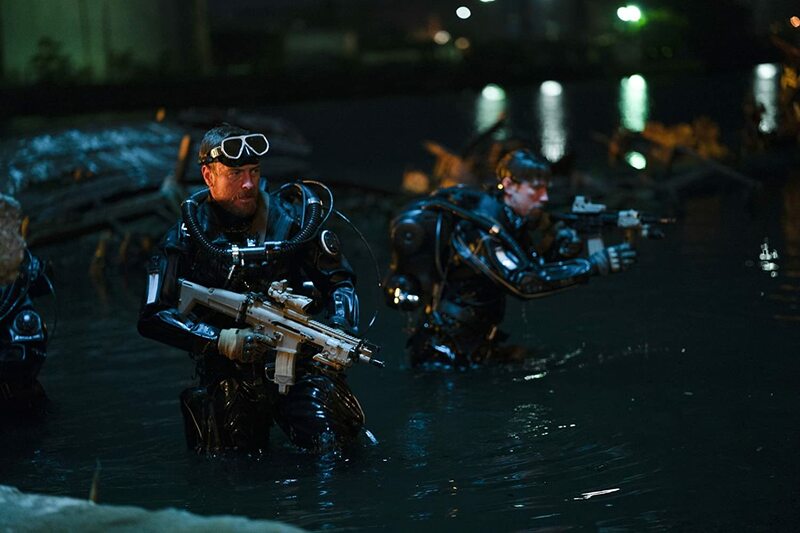 Speaking of which, the film’s action sequences are pretty good and give us different perspective on both land and under the sea in terms of battle engagements and tension-based moments. The film’s screenplay, which was adapted from Wallace and Keith’s novel by Arne Schmidt and Jamie Moss, keeps the movie streamlined, focusing on the three primary narrative threads and succeeds in bringing it altogether for a cinematic showdown. Again, while I can’t speak for Wallace and Keith’s Firing Point novel, the film story is mostly familiar from past military action movies, but plays them while quite well, despite the movie fumble through some areas (more on that below). As technical presentation, Hunter Killer is a solid endeavor, projecting the right amount realism detail of bringing this military action adventure to life. With the film taking inspiration from real-life submarines (the crew did their research on how close-quarters / interworking on a US submarine work and function), the movie’s production designs by Jon Henson and James H. Spencer are quite brilliant, making the interior sequences (personal quarters, commanding deck, mess hall, missile cargo holding room, etc.) look authentically real and great (and proximity the set decorations by Orlin Grozdanov and Robert Wischhusen-Hayes as well). In addition, the film’s cinematography by Tom Marais and film editing by Michael J. Duthie are also quite good, making their respective parts on Hunter Killer work quite well, especially when crafting (and sharpening) the movie’s theatrical cinematics. Additionally, the film scored done by Trevor Morris is rather good, adding that extra cinematic quality (musically speaking) to Hunter Killer’s proceedings; adding dramatic tension melodies and suspenseful buildup throughout. There are several problems that Hunt Killer can’t overcome, making the film’s shortcomings falter under its military action premise. The most notable one that many will find with this movie is that its familiar narrative tropes. Given the nature of the film’s premise, its easy to find the Hunter Killer’s story a bit commonplace with plenty of overused plot points: the tension between US and Russia, a militaristic coup d’état, Navy SEALS going undercover, war room frenzies, the lone “soldier” scenario, and plenty of near / last-minute misses. Basically, if you ever seen several action movies during the 90s or even played a single Call of Duty video game (most notable after Modern Warfare), then you’ll know what I’m talking about. Despite the movie being engaging in its narrative, the narrative plot itself (mostly certain aspects of the story) aren’t exactly creatively original. Thus, the overall formula of the narrative (story-wise) is a bit predictable and doesn’t really “draw” outside the lines that are laid down by Marsh (and the screenplay by Schmidt and Moss). In the end, it didn’t bother me as much, but I think the actually story narrative, despite working within the parameters of Wallace and Keith’s novel, could’ve been a bit more creative in a cinematic way (a few more unexpected twists and turns rather than a straightforward one). Speaking of the screenplay done Schmidt and Moss, the film’s dialogue isn’t exactly sharp…if you know what I mean. Spoken dialogue lines come off as broad and tad bit clunky. I’m say its terribly-written, but you can obliviously tell that the written dialogue is more in line with a Call of Duty video game (speaking in broad terms) and isn’t exactly clever as it wants to be. Thus, it certainly falls to the acting talents of the individuals to elevate the mediocre dialogue in Hunter Killer. However, the characters themselves are a bit “broad”, but more on that below. Additionally, the film’s ending could’ve been expanded upon and could’ve added some closure to the film’s respected characters. The cast in Hunter Killer has several well-known and recognizable names attached to the project, which does a cinematic flavor of “promise” to the movie’s proceedings. Unfortunately, while the talents are there, majority of these characters are mostly broad / stock-like with very little details and roundness to make them standout beyond the framework of the narrative’s story. Again, another problem of the film being a bit too familiar. 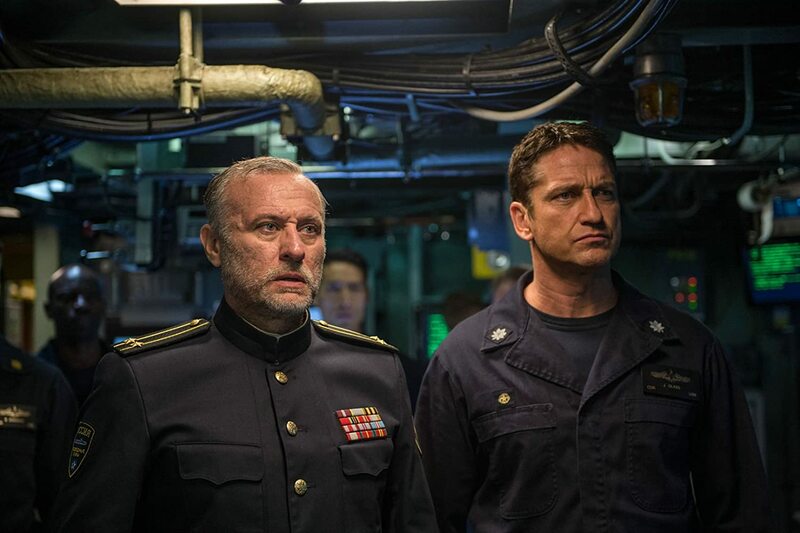 At the head of the pack is actor Gerard Butler, who plays Hunter Killer’s central protagonist character of Commander Joe Glass. Butler, known for his roles in 300, The Phantom of the Opera, and Law Abiding Citizen, is a perfect fit for the role Joe Glass; a stoic no-nonsense type of man who takes charge of the USS Arkansas (and its crew) on his own terms. While the character isn’t exactly original and is more of a broad stereotypical action hero (kind of sort of), Butler makes the role his own and finding his iteration of Joe Glass to be a suitable choice for Hunter Killer. To be honest, since he made his screen presence known by playing Leonidas in 300, Butler hasn’t exactly had the greatest career, with many roles being “too wooden” in otherwise mediocre features (i.e. Gods of Egypt, The Gamer, Olympus has Fallen, and Geostorm). Thus, I was surprise how much I liked Butler as Glass and he definitely anchored the film during the narrative thread on the USS Arkansas. Additionally, there is a plethora of minor supporting characters that make up the crew of Arkansas, but they are too numerous to list off in this review. Suffice to say that majority of them (if not all) do well in their respective roles onboard the USS Arkansas (be small roles or just physical present in the feature). The other major players (mostly the “big ticketed” stars of the feature) are represented in the “B” storyline, which focuses on the drama taking place within the CIA’s intelligence war room; finding actor Gary Oldman (Darkest Hour and Tinker Tailor Soldier Spy) as CJCS Admiral Charles Donnegan, rapper / actor Common (The Hate U Give and Smallfoot) as Rear Admiral John Fisk, and actress Linda Cardellini (Avengers: Age of Ultron and A Simple Favor) as NSA senior analyst Jayne Norquist respectfully. While these two actors (and actress) are the most recognizable in Hunter Killer (beyond Gerard Butler), they serve to anchor the movie and lending the acting talents to this storyline thread, which they do solidly. The problem, however, is that, while this trio are good, they’ve done (and played) in better previous roles that the ones they are playing in Hunter Killer. Again, this is mostly due to the character’s being extremely broad (i.e. the senior admiral, the mid-level commander, and the intelligence analyst) with very little character growth and mostly serving the plot of the film rather than personal development. Still, Oldman, Common, and Cardellini’s acting talents elevate their thinly-sketched characters on-screen. While USS Arkansas is considered the “A” storyline and the CIA war room is the “B” storyline, then the narrative thread that focuses on the Navy SEAL team that goes behind enemy lines (as well as the Russian “coupe de tat” storyline is the “C” storyline in Hunter Killer. The cast of the Navy SEAL team, which consist of actor Toby Stephens (Black Sails and 13 Hours: The Secret Soldiers of Benghazi) as Lieutenant Bill Bearman, actor Gabriel Chavarria (Freedom Writers and War for the Planet of the Apes) as Jimenez, actor Zane Holtz (Beyond the Night and The Perks of Being a Wallflower) as Martinelli, and actor Michael Trucco (Battlestar Galactica and Hush) as Hall, are good in their roles and are fine in the movie. Again (like a lot of characters in the movie), these characters are very broad, playing the stereotypical Navy SEAL team (miltary-ish commando comradery) that display large-than-life heroics. Rounding out the film’s cast are the film’s Russian-based characters, which is consist of actor Alexander Diachenko (The Star and White Gold) as Russian President Zakarin and actor Michael Gor (Bridge of Spies and The Hitman’s Bodyguard) as Russian Defence Minister Dmitri Durov, are effective in the individual roles as presidential captive and antagonist usurper. All in all, both are perfectly fine in their respective parts. Lastly, it should be noted that actor Michael Nyquist (The Girl with the Dragon Tattoo (the Swedish version) and John Wick), who plays Russian Captain Sergi Andropoyov in the movie, passed away on June 27th, 2017, making his involvement in Hunter Killer one of three of his last movies (all three to released in 2018) before his untimely death (i.e. RIP Nyquist). The USS Arkansas heads into troubled waters and helps aide in a rescue attempt from a Russian coupe in the movie Hunter Killer. Director Donovan Marsh latest film sees plenty of action thrills and nuances throughout the film and plays up the “action spirit” from the 90s. While the movie does stumble into familiar military movie tropes (and clichés) as well as some of the slightly generic characters, Hunter Killer succeeds in presenting itself as a classic action movie, which is well-made and has enough gleeful action fun to keep it engaging and entertaining, especially thanks to Marsh’s direction and the film’s cast. Personally, liked this movie. Yes, it had its problems and didn’t really “color outside the lines”, but I actually enjoyed the feature (probably a bit more than many other movie critics out there would). I don’t know…. I think of this as a good guilty pleasure action flick. However, some might not see it that way. Thus, my recommendation for this would be both a “recommended” one, especially most for action movie junkies out there and some causal moviegoers out there as well as an “iffy choice” for everyone else. That being said, at the end of the day, Hunter Killer may not be the quintessential military action (won’t beat out The Hunt for Red October or Crimson Tide of submarine themed features), but it is still strong (and engaging) one that succeeds in being cinematically entertaining in the realm of movie escapism.